Forced to make a living Gully moved to London and set up a practice in Leicester Square, Soho. In 1831 he married a family friend, Fanny Court (d. 1838); between 1832 and 1837 they had four children (two boys and two girls) and to supplement his income Gully also established his journalistic career, as co-editor of the London Medical and Surgical Journal and the Liverpool Medical Gazette. In the former he published in 1834–5 a condensed account of Broussais's ‘Lectures on general pathology’, and in the latter F. Magendie's ‘The rationale of morbid symptoms’; both were well received, as had been his 1834 translation, with teaching notes, of Tiedemann's Physiologie des Menschen. About this time Gully was also elected a fellow of the Royal Medical and Chirurgical Society of London, and a fellow of the Royal Physical Society of Edinburgh. In 1836 Gully moved his practice west to Sackville Street in Piccadilly, where he became a neighbour to his future collaborator, Dr James Wilson, with whom he shared the radical medical view that much of current medical practice was ‘effete, inefficient, if not positively harmful’ (Gully). Gully was a moderate Liberal in his politics. In 1838 family tragedy struck again when his wife, Fanny, died of smallpox; Gully managed to continue to write and socialize and his adaptation of Dumas's The Lady of Bellisle opened at the Drury Lane Theatre on 4 December 1839. But in 1840 his youngest daughter, also named Fanny, died of croup, and shortly afterwards, on 14 October 1840, Gully married a widow, Frances Kibble, who was seventeen years older than himself. The marriage was a failure from the start since Frances refused to undertake care of the children, and they separated shortly afterwards. During this period Gully was still active in the medical field, producing a tract on nervous diseases in 1837, and his first exploratory work on physiology, The Simple Treatment of Disease Deduced from the Methods of Expectancy and Revulsion, in 1842. That same year James Wilson came back from Graefenburg in Austria, ‘filled to the brim’ (Gully) with the hydropathic water cures practised by Vincent Priessnitz and determined to introduce them into England. The two friends joined forces, and finding Malvern, Worcestershire, an ‘appropriate locality for the practice of hydropathy’ (ibid.) Wilson at once settled there, followed a few months afterwards by Gully and his family. Malvern was a small old spa town, and Wilson was able to purchase a bankrupt hotel while Gully took on two large houses in Wells Road. Wilson's book The Water Cure (1842–3), published immediately on his return, brought the first patients in, and from then on both practices flourished, bringing a new ‘health industry’ to Malvern. Acting as both partners and rivals, Gully and Wilson were quickly able to re-equip their houses as ‘sanatoriums’ with all the requisite indoor and outdoor baths and douches. The outdoor regime was strict and invigorating, but not gruelling (donkey rides were a speciality), and throughout the 1840s and 1850s Malvern attracted a stream of celebrated visitors, including royalty. Gully wrote his most popular work, The Water Cure in Chronic Disease, in 1846, and from 1847 onwards he treated, among others, Alfred Tennyson, Thomas Carlyle, Bishop Wilberforce, and Charles Darwin. He became editor of the Water Cure Journal in 1848. Gully continued to be intellectually radical in his therapeutics, and later developed an interest in mesmerism and homoeopathy; he also wrote a popular Guide to Domestic Hydrotherapeia in 1863. Wilson's was the larger hydro, but Gully was more involved in the development of the town. Between 1856 and 1866 he was chairman of the Malvern Improvement Commissioners, he started the Malvern News, and he supervised the building of a new railway station, a luxury hotel, gas works, and a new school, Malvern College—not without some resistance from local inhabitants. For relaxation, Gully spent three months of each year on the continent, and in later life he became a fervent believer in spiritualism, acting as the friend and protector to the spiritualist medium Daniel Dunglas Home and his family. He also edited Drawings Descriptive of Spirit Life and Progress. By a Child Twelve Years of Age (1874). In 1867 James Wilson died and, though he had been estranged from Gully for many years, it was the end of an era. Five years later in 1872 Gully resigned his practice to his partner Dr W. T. Fernie, with full public honours. His retirement was blighted, however, after 1876, when his name was linked intimately with a woman friend, Mrs Charles Bravo, who was accused of murdering her husband. The Bravo case caused a popular sensation and ruined Gully's professional reputation. He withdrew from public life, and died on 27 March 1883 at Orwell Lodge, Bedford Hill Road, Balham, London. His last work, A Monograph on Fever and its Treatment by Hydrotherapeutic Means, was edited posthumously in 1885 by his son, a future speaker of the House of Commons, William Court Gully. The Water-Cure in Chronic Disease; An Exposition of the causes, progress, and termination of various chronic diseases of the digestive organs, lungs, nerves, limbs, and skin; and of their treatment by water, and other hygienic means London: John Churchill. (1846). 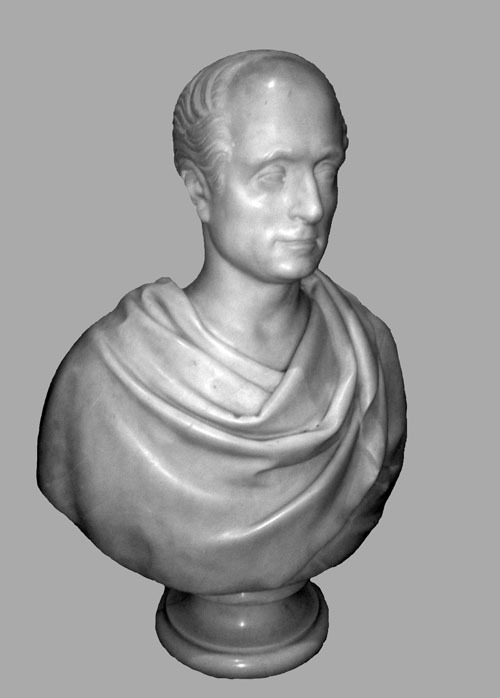 John Lawlor (c1820 Dublin –1901 London) was an Irish sculptor and medallist, elected to the Royal Hibernian Academy in 1861. He spent most of his career working in London, specialising in poetic subjects and portrait busts. He is noted for various statues in London, his 1881 bronze statues of Patrick Sarsfield in the grounds of St John's Cathedral in Limerick, and the 1889 statue of Bishop Delany at St Mary's Cathedral in Cork. Lawlor received his art training at the Royal Dublin Society's Schools, studying sculpture under John Smyth (c1773-1840). In 1843 the Royal Irish Art Union purchased his "Cupid pressing Grapes into the Glass of Time," and was won as a prize by the Countess of Ranfurly. He exhibited a "Boy and Dog" at the Royal Hibernian Academy in 1844, and was one of eight artists commissioned to produce the plaques on the corners of the Albert Memorial in Kensington Gardens, also executing the large group "Engineering." From his first contribution in 1844 he continued to exhibit at intervals with the Royal Hibernian Academy. His "Bather" was exhibited there in 1851, and at the Dublin International Exhibition in 1853, and was later rendered in marble for the Prince Consort and placed at Osborne in 1856. His statuette, "Solitude," and the group "Suffer little Children to come unto Me", were purchased by the Art Union, and appeared in the London Exhibition of 1851. Other works by Lawlor which received acclaim were "Titania," a marble statue in the Royal Academy in 1868, the "Emigrant" of 1853 and "Clio". He visited America in 1886, and received a number of commissions, remaining there until the autumn of 1888. On his return he stayed in Cork for some time, finishing the statue of Bishop Delany which was placed outside the Cathedral, and some statues for the Queenstown church in Cork. He did quite a number of busts including that of "Daniel O'Connell," "Smith O'Brien," "O'Connor Power" and "James O'Kelly, M.P." He was a popular figure in London's artistic and literary circles, his tall, striking appearance, ready wit, genial manner and fine baritone making him a sought-after guest. He did not produce a steady output, but rather worked only when the inclination took him or when obliged by financial necessity, and thus did not provide for his old age. He remained a bachelor his entire life. His sister Bridget had married John Kelly, a blacksmith and draymaker, and remained in Dublin. When her husband died in 1861, she herself in poor health, moved to London with her 5 children. Aloysius, the youngest boy, would eventually become an accomplished painter under the name Aloysius O'Kelly. In London, John Lawlor had become a loyal supporter of the secret Irish Republican Brotherhood or Fenians,2 and was careful to keep his political affiliations out of his public life as an artist. His home was regarded as a safe house by the movement. 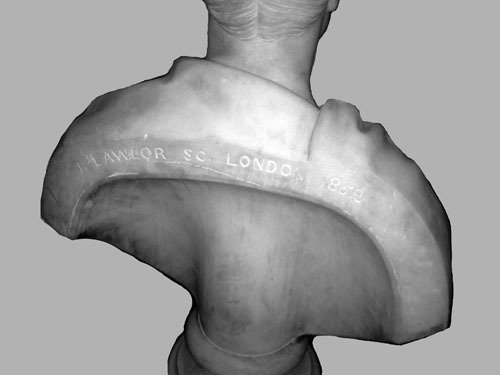 View of the reverse of the sculpture showing the signature and inscription.